Procedures and protocols for communicating during an emergency will follow guidelines set forth in NIMS. All communication pathways will be resilient, interoperable, and redundant. Communication is divided into two categories: tactical or “on-scene” communication and strategic communication. In tactical communication, responders communicate within a particular command element on activities necessary for carrying out operational objectives. 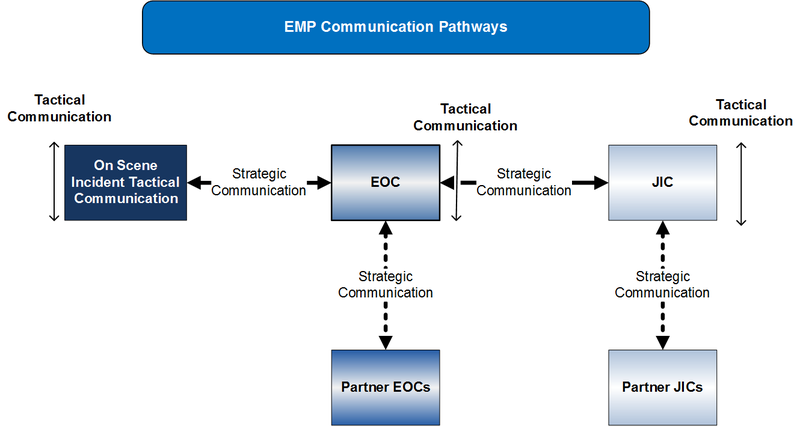 Strategic communication reaches across ICS organizational elements and conveys situational awareness, resources requests, and other response-related information. Tactical communication modalities will be assigned in each individual plan or Standard Operating Procedure (SOP). Personnel will receive pre-event or just-in-time training on the use of communication equipment and proper communication protocols. Strategic communication will use landline and cellular phone as the primary method of communication. Radio, email, and other web-based communications will be used in the event that primary methods of communication are unusable. All communicative devices used in emergency operations will be identified in ICS Form 205 in the IAP.